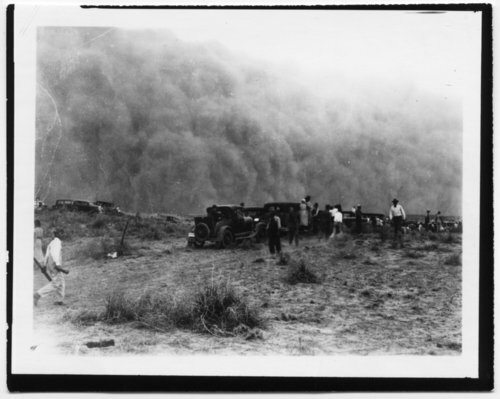 A photograph showing a group of people and cars with an approaching dust storm near Tyrone, Kansas. The people were possibly participating in a rabbit drive. It was organized to eliminate rabbits that were destroying already limited pastures. Pens were built and residents gathered to drive the rabbits through the fields into the pens where the animals were killed. The meat provided a source of food at a time when people were suffering from the depression.